Air France Flight 447 sent out 24 automated error messages — including one saying the aircraft’s autopilot had disengaged — before it vanished with 228 people on board, aviation investigators said Saturday. But even as they analyzed the error messages and satellite images of the doomed flight’s path, investigators said they still have a lot of work to determine what caused the plane to go down. “I would just like to ask you to bear in mind that all of this is dynamic and there are a lot of question marks,” Paul-Louis Arslanian, head of France’s accident investigation bureau told reporters. “We don’t know how the aircraft entered the water. We don’t know how these pieces of debris entered into the water and that you have to take into account the current … and the shape of the ocean floor.” The error messages suggest that the plane may have been flying too fast or too slow through the stormy weather it encountered before the crash, officials said. In addition, investigators have said the plane’s autopilot disengaged, cabin pressure was lost and there was an electrical failure before the disaster. The jet’s manufacturer, Airbus, sent a Telex to operators of Airbus models reminding them of what to do when speed indicators give conflicting readings. The spokesman said the notice does not mean there is any major flaw in the aircraft, but is simply a reminder to pilots of what to do in the cockpit if they get conflicting information about air speed. Watch as experts question whether recovery is possible » All 228 passengers and crew aboard the Airbus 330 are presumed to have died when the plane disappeared northeast of the Fernando de Noronha Islands, an archipelago 355 kilometers (220 miles) off the northeast coast of Brazil. 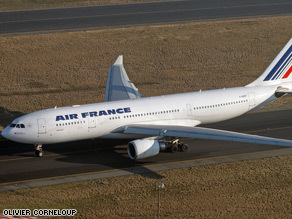 The flight originated in Rio de Janeiro, Brazil, and was en route to Paris, France. Map of Flight 447’s flight path » Search teams were still trying to find debris from the jet Saturday, two days after a Brazilian Air Force official said debris plucked from the ocean was not from the Air France jet.